"...There is much to like in this Chicago production, including some smart choices from the director Kurt Johns, an experienced hand at solo work, the comedic richness of Foust's characterizations and a lovely jewel-box like setting from Grant Sabin." "...In this engaging work of theatrical storytelling, originally performed off-Broadway by Lecesne himself, ABT ensemble member Joe Foust portrays multiple roles under Kurt Johns's astute direction." "...Is this a whodunit, then? Is it a hagiographical account of another martyr in the chronicles of gay history, an inspirational sermon on the healing powers arising from tragedy, or a lesson in the evils of intolerance? Whatever label you affix to this 75-minute monologue is up to you, of course, but what is undeniable is the wholesale commitment that Foust bestows on each of his diverse personae, rendering their individual attributes so distinctive that, at the moment of crisis, we need only hear the messenger's voice to identify the bearer of the final clue resolving the mystery." 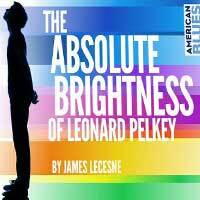 "...What's so seductively marvelous about Joe Foust's one-man turn through James Lecesne's bittersweet play "The Absolute Brightness of Leonard Pelkey," currently in production at American Blues Theater, is not simply the actor's ability to sustain a complicated narrative alone on the stage. What's absolutely magical is Foust's blink-of-an-eye transformations from one fully formed character into another, each new persona as distinctive, empathic and credible as the last." "...This is seventy-five minutes of story-telling and is done by one actor, Joe Faust, who I must say, truly shines in bringing the entire cast of players to the front. Yes, he plays them all for us. No costume changes, no set changes, just a combination of props (Mary O�Dowd) , projections ( G. �Max� Maxin IV) and solid direction by Kurt Johns, who has become the �master of the solo show�, in my book." "...Foust is a dynamo in a show like this. His ability to wholly embody different characters from one second to the next is perfectly suited for a show demanding a character actor extraordinaire. There are a few, albeit gimmicky, props to add to the fantasy, but Foust hardly needs them to introduce an audience to the menagerie of fascinating small town folk." "...But it is Foust�s effortless storytelling skills, comic sensibility and emotional range that seal the deal and bring Leonard Pelkey back to life through others� perceptions." "...In this single performance, playing dozens of touching, often humorous, three-dimensional characters, Joe Foust dazzles as never before. It�s in this gifted thespian�s performance, set in the intimate venue of Stage 773, that the true absolute brightness of this whodunit tale really shines." "...In a small town on the New Jersey shore, a story unfolds�Case #3684599, otherwise known as James Lecesne�s �The Absolute Brightness of Leonard Pelkey��about the disappearance of a 14-year-old boy as told by the detective who worked on the case, Chuck DeSantis, and an ensemble of eight other characters, all played by one actor. American Blues Theater�s Chicago premiere production is directed by Kurt Johns and showcases the talented Joe Foust as the singular storyteller in the crisp 90-minute drama now playing at Stage 773."